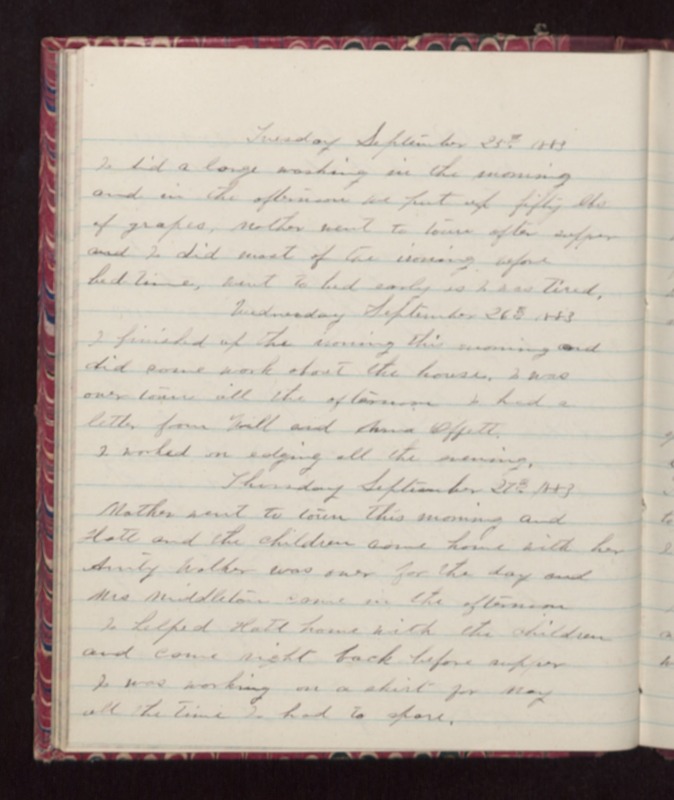 Tuesday September 25th 1883 I did a large washing in the morning and in the afternoon We put up fifty lbs of grapes. Mother went to town after supper and I did most of the ironing before bed-time, went to bed early as I was tired. Wednesday 26th 1883 I finished up the ironing this morning and did some work about the house. I was over town all the afternoon I had a letter from Will and Anna Offett. I worked on edging all the evening. Thursday September 27th 1883 Mother went to town this morning and Hatt and the children came home with her Aunty Walker was over for the day and Mrs Middleton came in the afternoon I helped Hatt home with the children and came right back before supper I was working on a skirt for May all the time I had to spare.